The key to your landscaping beauty is an aesthetically pleasing balance of both "softscape" features and "hardscape" features. While "softscape" usually encompasses all flora, such as plant and trees, "hardscape" is the beautifully angled touches of stone work and masonry features. 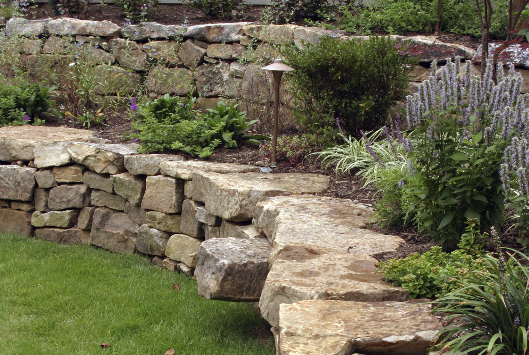 Stonework is one of the most important features of a good landscape. It can serve many purposes, and can be inviting, entertaining, and calming - all at the same time! Knowing where stonework belongs, and where to opt for something softer is truly an art - and one you can count on us to be proficient with. Whether you're thinking concrete, flag stone, flowerbed walls, retaining walls, patios, brick features, or gravel and gravel mulch (and more! ), we've got the solution for you. We offer a comprehensive array of stunning stonework, and can work with you one-on-one to determine the best features, placement, and practical use. We can also consult on large decorative stones and rocks - a truly personalized feature of many modern landscapes. You may also be considering unique stone features, such as the increasingly popular fire pit or combination stone/water features - a tranquil and attractive feature to any backyard. We can offer our professional expertise on these types and features, and others, from consultation to installation. Don't go into your landscaping stonework project blind. Let us help you - with any aspect big or small - to make this important project the best it can possibly be!